The four channel Arduino multimeter can measure four independent DC voltages that can each be in the range of 0 to 50V. Voltages are displayed with one decimal place, e.g. 5.3V, 12.8V, etc. This video shows the Arduino voltmeter being used to measure the voltage of four batteries. Each battery has a different voltage. Also see the Arduino software voltmeter project for an Arduino voltmeter that displays voltages on a PC instead of LCD. Each channel of the Arduino voltmeter has a pair of resistors that form a voltage divider. The voltage divider scales down the input voltage to a range that the Arduino can measure. Code running on the Arduino calculates the actual voltage and displays the result on the LCD. How the voltage divider works, precautions and voltage range are explained in the article Measuring DC Voltage using Arduino. The Arduino voltmeter uses the same resistor values as the article. The LCD used in the circuit has the pin numbering shown in the LCD component information from the beginner's tutorial on this website. It is important to check that the LCD that you are using has the same pin numbering as the circuit diagram. Making incorrect LCD connections can damage the LCD. If you are using a LCD with different pin numbering, use the pinout information from your LCD's datasheet to make the connections to the Arduino. 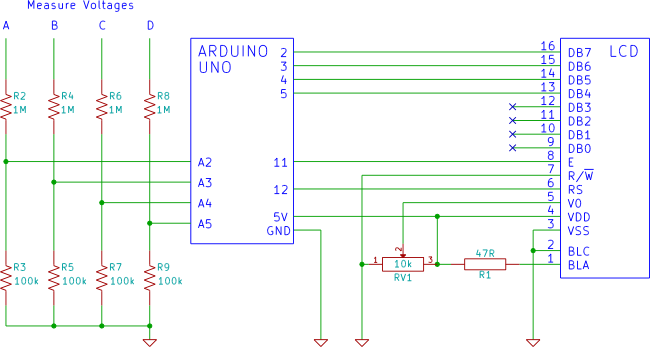 The Arduino LCD tutorial explains how to connect a LCD to an Arduino Uno. The soldering article has a video that shows how to connect a pin header to the LCD so that it can be plugged into a breadboard. Voltages are measured between points A, B, C or D and GND or 0V. Remember to adjust the contrast pot. so that the voltages on the LCD are made visible. Resistor R1 provides current limiting for an optional backlight and keeps the backlight permanently on. The sketch is based on the code from the Measuring DC Voltage using Arduino article. The sum and voltage variables have been changed into arrays so that they can store values from four analog channels. The voltage calculations work the same way as the original sketch, but now do the calculations for four channels. Hardware:     Arduino Uno with voltage dividers on A2 to A5. Arduino example sketches from IDE. Calibration works the same way as explained in the Measuring DC Voltage using Arduino article, but now the division factor of 4 voltage dividers must be calculated instead of 1. Measure the 5V voltage and change the value of V_REF to the measured voltage. Measure the voltage with the circuit / LCD connected and running the sketch because the voltage may change when the LCD is connected. As an example, when doing this project, the measured voltage dropped from 5.015V without LCD connected to 4.991V with LCD connected on the same hardware. Change the voltage divider values for each divider next to DIV_1 to DIV_4 at the top of the sketch. DIV_1 to DIV_4 correspond to analog pins A2 to A5 respectively. Measure the voltage drops across each divider network and calculate the division factor as explained in Measuring DC Voltage using Arduino.